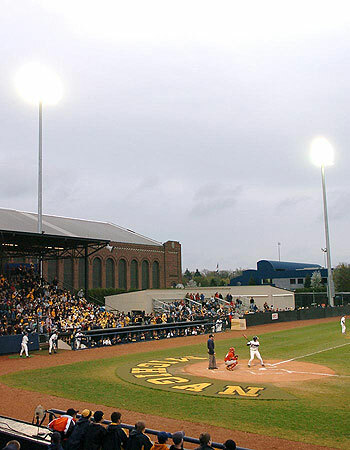 Just so I won't get sued, but the football, basketball, baseball, and softball pics are from MGoBlue.com and the hockey pic is from MichiganDaily.com. Credit where credit is due, hehe.) GO BLUE!!! Welcome and best wishes to Coach John Beilein, the new men's basketball coach of the Wolverines. Time to get back on track and return to the NCAA Tournament... GO BLUE!!! Congrats to Kevin Porter, the 2008 Hobey Baker Award winner, the #1 player on the #1 team!!! Meanwhile... football season not only once again ends in disappointment, it ended in the worst season Michigan has had in quite awhile if not ever. Although it is understandable that after Coach Lloyd Carr left that it would take time for transition, I doubt most people anticipated that the first year (and now second year) under Coach Rich Rodriguez would be this difficult. Let's hope next year goes better, or else Coach Rodriguez is going to need a new job... Go Blue!!! For more on Mr. Michael Phelps and the rest of the Wolverine gang at the Beijing Olympics, see here. Yankees alert! From left to right: Jorge Posada (1), Derek Jeter (3), Gerald Williams (4), Jeff Weaver (6), and Jason Giambi (7) at Crisler Arena for Michigan's season opener vs. Oakland. In reality, they were there really for the Michigan/Ohio State game on Nov. 22, 2003.